After having launched its European Platform, Raisin is now available with its new French platform www.raisin.fr. Berlin/ Paris, May 31th – Today Raisin, the Pan-European online deposit marketplace, has launched www.raisin.fr for customers in France, in French language and with dedicated French customer support. Within a few weeks after the European launch Raisin managed to start also in France. “We are proud to be the first online platform in France offering term deposits to French savers. That shows that Raisin is a pioneer in Europe.” says Katharina Lüth, Head of Europe. With Germany – via its WeltSparen Platform – and France Raisin is now offering localized services to customers in the two largest Euro savings markets. The French lack access to investment alternatives that combine attractive interest rates, simplicity, and low risks. At the moment a record amount of more than EUR 380 billion is lying on French current accounts without earning any interest (source: Banque de France, May 19 2016). 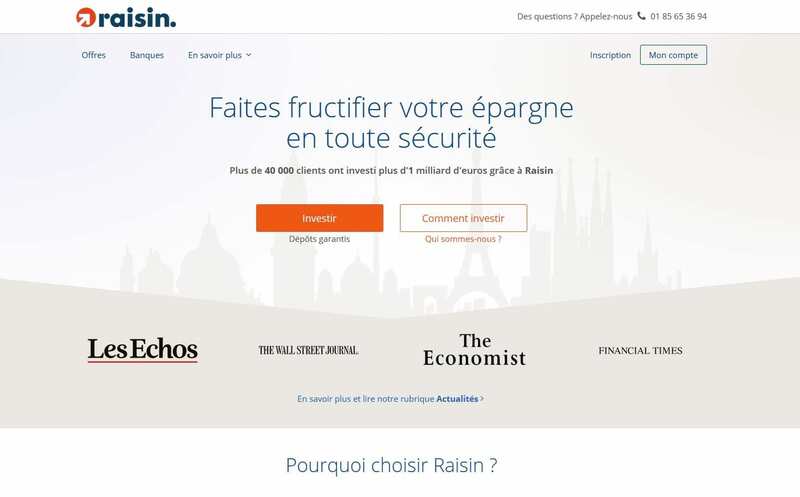 Raisin CEO and founder Dr. Tamaz Georgadze states: “Raisin allows its clients, to place their savings in a foreign bank that offers higher interest rates than the French average for similar products in just a few online steps”. All deposits with Raisin are guaranteed 100% up to EUR 100,000 per depositor and per bank by each national deposit guarantee scheme in accordance with EU directives. Raisin is free of charge for customers and currently offers interest rates of up to 1.48% p.a. (AER). The service is offered jointly by Raisin GmbH and its 100% subsidiary Raisin France SAS which holds a license as an intermediary in banking transactions and in payment services in cooperation with Keytrade Bank SA/NV. Further localized platforms will follow in the coming months. Raisin GmbH and Raisin France SAS – its 100% French subsidiary – jointly operate www.raisin.fr in cooperation with Belgian Keytrade Bank SA/NV. Raisin France SAS – holds an IOBSP (Intermédiaire en operations de banque et en services de paiement) license and is registered with ORIAS registration number 15004576. Raisin GmbH (formerly known as SavingGlobal GmbH) was founded in 2012 and via its German platform WeltSparen obtained more than 40,000 customers who have deposited more than EUR 1 billion within the first two years. The company has more than 60 employees from over 16 different nationalities. The founders of Raisin remain majority shareholders, holding more than 40% of the company. Raisin is also supported by several investors such as Index Ventures and Ribbit Capital.